1 tablespoon Maca power blends (it is a combination of maca & cacao). If you can’t find it, just use cacao, the Maca is only added for health benefits, not taste. 1. Dissolve 1 tspn instant coffee in 1 tablespoon boiling water. Or use 1 tablespoon good coffee! Let it cool. 2. In the blender, throw in frozen banana, coconut water, coffee, maca blend, cacao. Every blender is different – it might take as little as 30 seconds before it is a smoothie/thickshake consistency. **the raspberry ‘sorbet’ is from a smoothie I made on Friday – it is totally raw vegan & made simply of leftovers of 1 cup frozen raspberries, 1 frozen banana & 1/4 cup coconut water. I just froze the leftovers in a silicone cupcake mould then took out of the freezer to use in this smoothie. I hate wastage! 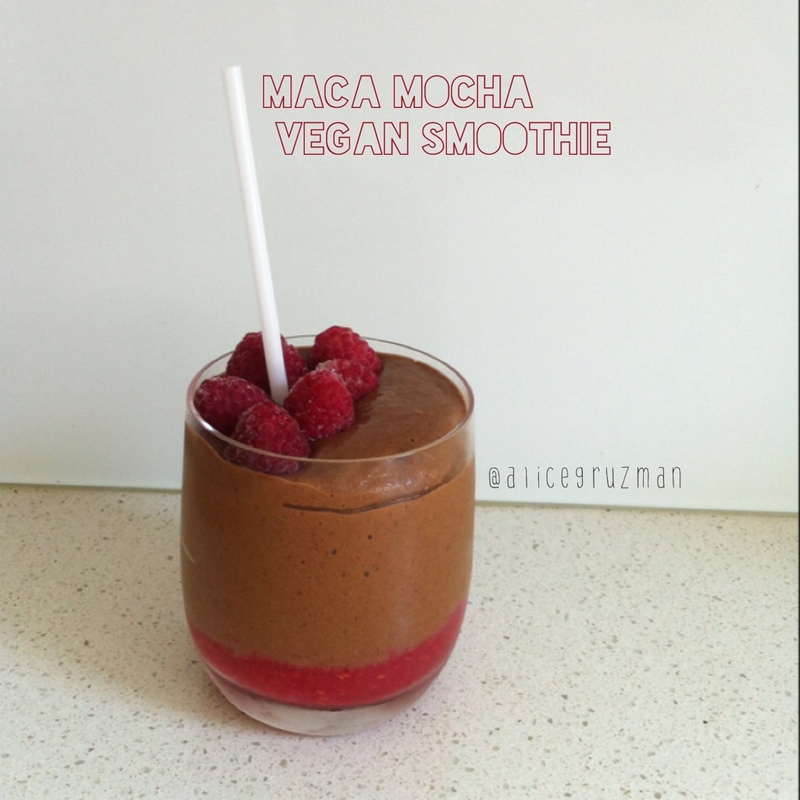 This entry was posted in Recipe and tagged banana, cacao, chocolatethickshake, maca, mocha, raspberry, smoothie, vegan, vegansmoothie by 6 Clean Ingredients. Bookmark the permalink.